If Lewis J. Bennett read the Buffalo Express Morning on September 7, 1911, he may have protested the verbiage of an article about “Revere place, the pretty new street in the Central Park district.” Bennett, the visionary behind the Central Park area bounded by Main Street, Woodbridge Avenue, Parkside Avenue, and Amherst Street, intended for that neighborhood to be an exclusive enclave of large homes on expansive lots. With the strike of a pen, however, the newspaper associated several new streets north of Huntington Avenue with Bennett’s prestigious residential development. Brothers William C.T. (1873-1959) and Arthur Suor (1874-1936) developed several streets just beyond Central Park as the frontier of residential development in Buffalo pushed northward. Between roughly 1908 and 1912, the brothers developed a handful of one-block streets near some of the main thoroughfares of Central Park, including Starin and Vorhees Avenues. 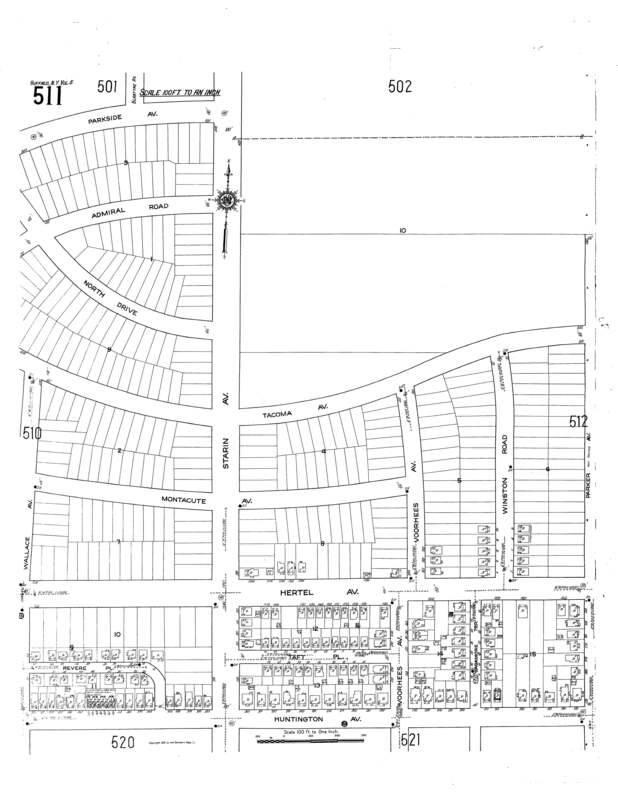 Unlike Central Park streets such as Depew, Morris, and Wesley Avenues, however, Revere Place, Taft Place, and Sagamore Terrace featured speculatively built homes on modest lots (see map). The Suor & Suor Building Company constructed homes and led a marketing campaign that offered modern amenities expected of new houses in this growing area of town to a middle class consumer that could not afford to live in Central Park proper. This business model started at the foundational level of how they created streets and parcels. 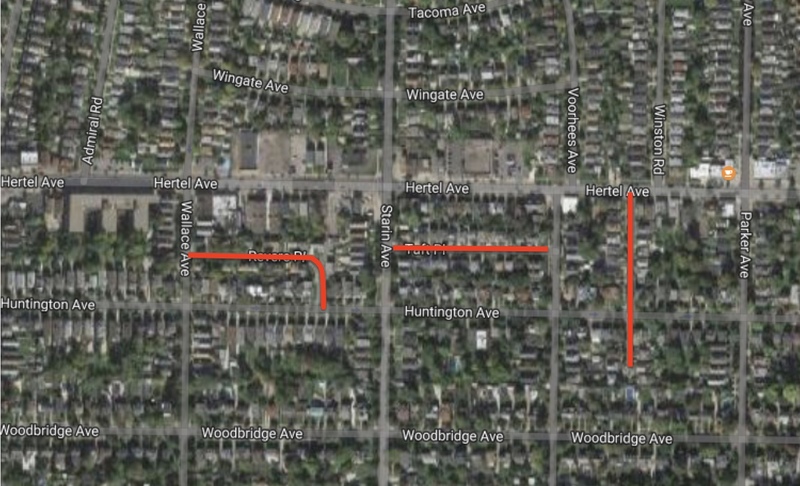 Revere Place, Taft Place, and Sagamore Terrace are one-block streets that bisect three consecutive city blocks located between Wallace and Parker Avenues on the west and east, and Huntington Avenue and Hertel Avenues on the south and north. Revere Place cuts a curvilinear path between Wallace and Huntington Avenues, and Taft runs straight through the middle of the block between Starin and Vorhees Avenues. Sagamore Terrace extends a block and a half south from Hertel Avenue, reaching into the adjacent block below Huntington Avenue. As a result of cutting new streets though larger, more traditional city blocks, the Suors created more street frontage, more lots, and ultimately, more houses to sell. The lots on these streets were significantly smaller than those in Central Park. On Revere Place, lots averaged 49×56 feet, while narrower and deeper lots—measuring approximately 36×80 feet—lined Taft Place. Sagamore Terrace featured the largest lots, with frontage averaging 45 feet and depths ranging from 80 to 130 feet. Compared with representative lot sizes of 60×157 feet on Woodbridge and 70×180 feet on Depew, the Suors’ homes clearly targeted a different consumer. The company offered prices and payment options for their modern homes that catered to middle class consumers. While regulations stipulated that homes on Central Park lots exceed $5,000, not including the price of the land, most surpassed $6,000 and several reached over $20,000. By comparison, the “Central Park bargains” on Taft Place, Revere Place, and Sagamore Terrace started at $4,350, all-inclusive. Sagamore Terrace, with the largest lots, featured the most expensive homes, reaching up to $7,500. In addition to lower prices, the Suors boasted an attractive payment plan intended to turn renters into homeowners: “Don’t sign another lease,” their advertisements appealed. While some homes sold in cash transactions, the “very practical plan of easy payments [made] it possible for the man with a limited income to buy an up-to-date home on about the same as a rental basis.” The prices and payment plan made it accessible for members of the middle class to buy a new house in an up and coming area of the city. While it is hard to imagine today how remote this area felt in 1910, North Buffalo was mostly farmland. Years later, longtime residents of Taft Place explained, “When they moved there they could look across Hertel and see the cows placidly chewing in the pastures.” In fact, without homes on Starin, early residents on Revere Place and Taft Place could probably see one another through their yards. Yet, the Suors’ new streets signaled the growing momentum of development in what is now North Buffalo. By contrast, as a current Revere Place resident, I find the “metropolitan” location of these streets between Hertel Avenue and Central Park part of their appeal. I relish both the privacy of my one-way street and easy access to the commercial offerings on Hertel Avenue and the picturesque streetscapes of Central Park. The Suors quickly moved on to new developments after opening Taft Place, Revere Place, and Sagamore Terrace; yet, their “Central Park bargains,” remain charming urban streets that connect residents with the contemporary city while also embodying its past. *Thorne & Angell is responsible for developing streets including Richmond, Elmwood, Lafayette and Plymouth. **Numbers 41, 43, 44, 45, 49, 50, 53, 54, 60, and 61 were under construction in May. ***Despite this rhetoric, it appears that Suor & Suor constructed several flats on Huntington and Vorhees Avenues. ****According to the City Council minutes, several Revere Place residents erected garages in 1917, 1918, and 1921. “Main Street Homesteads Sold,” Buffalo Express Morning, September 7, 1911. “Real Estate Dealer 60-Year Veteran Here,” The Buffalo Courier-Express, September 30, 1951, 18-D. Proceedings of the Common Council of the City of Buffalo. Buffalo: Common Council, 1910. “Central Park—New Houses,” The Buffalo Courier, September 27, 1911, 11. “Central Park,” Commercial September 20, 1907, Buffalo Library, Streets Clippings, 97. Sybil Reppert, “Taft Place—They Dwell Together in Unity,” Buffalo Times, September 30, 1930. Streets Scrapbook pg. 73-74. Sanborn Fire Insurance Company, Buffalo, New York, 1916, Sheet 511. Sybil Reppert, “‘Home Folks’ Live on Sagamore Terrace,” Buffalo Times, August 30, 1930. Streets Scrapbook pg. 44-45. 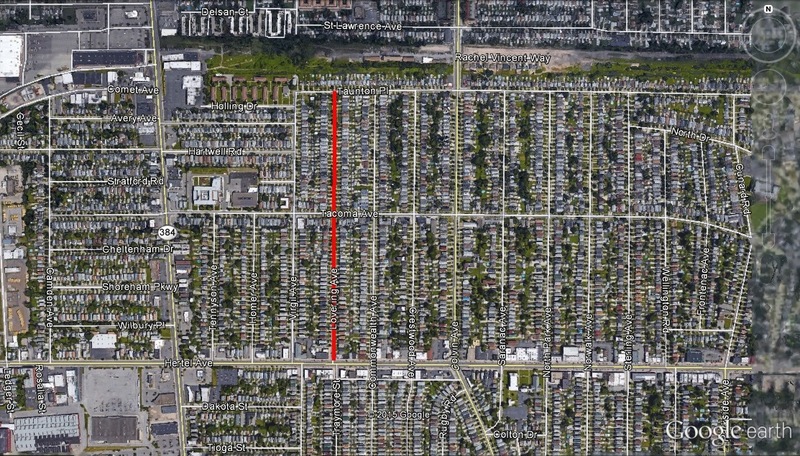 Lovering Avenue is a street in North Buffalo, running between Hertel Avenue and Taunton Place. The street is named after Sarah Lovering Truscott as well as her niece and daughter. The three Lovering women were influential women of their time in Buffalo. Sarah Mitchell Lovering Truscott was born in September 1828 and came to Buffalo as a young child with her family from Boston, Massachusetts. The family traveled to Buffalo via the Erie Canal and lived at 37 Eagle Street, which was one of the most fashionable neighborhoods in the City at the time. In 1851, Sarah married George Truscott, a banker with Manufactures & Traders Bank (now M&T) who also served as water commissioner. Mrs. Truscott was considered to be an efficient executive and was very involved in leading numerous charitable causes. She was a member of the women’s board of Buffalo General Hospital and promoted the nursing school, which was Buffalo’s first training school for nurses. She helped to organize and was president of the board of Children’s Hospital. The Truscott family lived at 340 Delaware Avenue until 1918, when they moved to 335 Delaware Avenue. 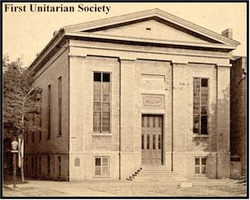 The family was active in First Unitarian Church, which was located at the corner of Franklin and Eagle Streets. The building was remodeled to add a third floor after it ceased to be used for church purposes and still stands, one of the oldest buildings in Buffalo. The church congregation still exists, having merged with the Universalist Church, worshiping on Elmwood Avenue. Sarah passed away in 1918 at the age of 90. Sarah’s niece, Mary Lovering, was considered to be one of the first local gentlewomen to earn her living outside the house – she conducted a dancing school. Sarah’s daughter, also named Sarah Lovering Truscott, was born in 1857. Sarah Lovering Truscott was one of the city’s pioneer women in the real estate business. Sarah was often see riding her bicycle to make a sale. At the time, bicycles were just coming into fashion, mostly for men. Many women began to ride bicycles as well, which many men scoffed at. However, bicycles allowed women a greater freedom and mobility to travel outside their homes and outside their neighborhoods. Sarah was involved in many causes including: assistant treasurer of Woman Suffrage headquarters, member of Buffalo Political Equality Club, member of the Equal Franchise League, president of Woman’s Civil Service Reform Association of Buffalo, member of the Executive Committee of the Neighborhood House ( a settlement house), and member of the Peace and arbitration Society of Buffalo. She was also a member of the Twentieth Century Club. Sarah Lovering Truscott died in November 1943 at age 88. “Few Streets Named by City Government” Courier Express, February 26, 1954. “Lovering Avenue Memorial Early Woman Philanthropist”. 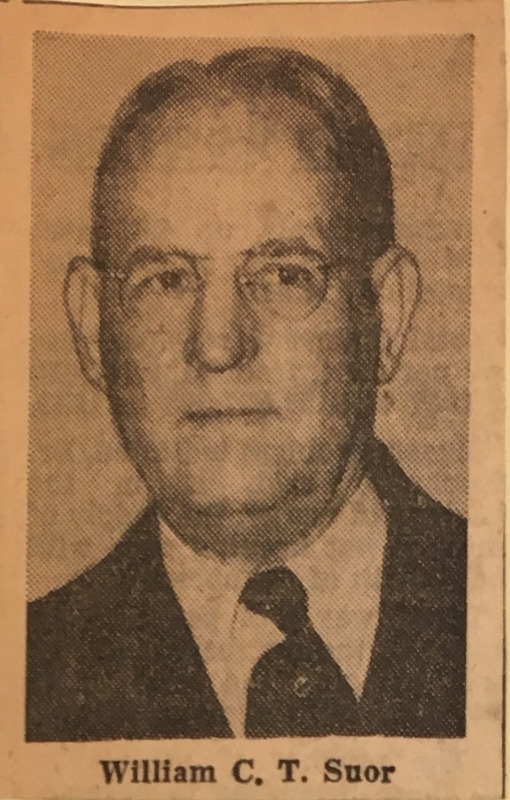 Courier-Express, June 23, 1940, p. 3.